In his "New York Times" best seller, "Good Calories, Bad Calories, " Taubes argued that our diet's overemphasis on certain kinds of carbohydrates--"not" fats and "not" simply excess calories--has led directly to the obesity epidemic we face today. The result of thorough research, keen insight, and unassailable common sense, "Good Calories, Bad Calories" immediately stirred controversy and acclaim among academics, journalists, and writers alike. Michael Pollan heralded it as "a vitally important book, destined to change the way we think about food." Building upon this critical work in "Good Calories, Bad Calories" and presenting fresh evidence for his claim, Taubes now revisits the urgent question of what's making us fat--and how we can change--in this exciting new book. Persuasive, straightforward, and practical, "Why We Get Fat "makes Taubes's crucial argument newly accessible to a wider audience. Taubes reveals the bad nutritional science of the last century, none more damaging or misguided than the "calories-in, calories-out" model of why we get fat, and the good science that has been ignored, especially regarding insulin's regulation of our fat tissue. 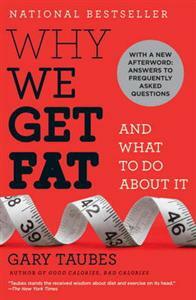 He also answers the most persistent questions: Why are some people thin and others fat? What roles do exercise and genetics play in our weight? What foods should we eat, and what foods should we avoid? Packed with essential information and concluding with an easy-to-follow diet, "Why We Get Fat "is an invaluable key in our understanding of an international epidemic and a guide to what each of us can do about it. Every day, over 200 million Americans consume food products made of wheat. As a result, over 100 million of them experience some form of adverse health effect, ranging from minor rashes and high blood sugar to the unattractive stomach bulges that preventive cardiologist William Davis calls "wheat bellies." According to Davis, that excess fat has nothing to do with gluttony, sloth, or too much butter: It's due to the whole grain wraps we eat for lunch. After witnessing over 2,000 patients regain their health after giving up wheat, Davis reached the disturbing conclusion that wheat is the single largest contributor to the nationwide obesity epidemic - and its elimination is key to dramatic weight loss and optimal health. 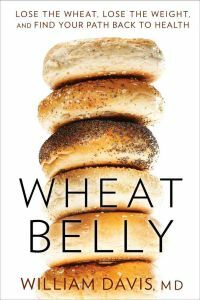 In "Wheat Belly", Davis exposes the harmful effects of what is actually a product of genetic tinkering and agribusiness being sold to the public as "wheat" - and provides readers with a user-friendly, step-by-step plan to navigate a new, wheat-free lifestyle.Informed by cutting-edge science and nutrition, along with case studies from men and women who have experienced life-changing transformations in their health after waving goodbye to wheat, "Wheat Belly" is an illuminating look at what is truly making people sick and an action plan to clear our plates of this seemingly benign ingredient.